In 1985, Richard Moll wrote a book about America’s premier public universities where he describes Miami as one of America’s original eight “Public Ivies.” Today, Miami lives up to its reputation as one of the premier public undergraduate-focused universities in the country. Direct entry as a freshman is quite competitive, however similar to OSU, “back door” entry is possible at lower GPA levels for transfer students. Since Miami offers relatively few graduate programs, they focus on undergraduate education and do it well. At Miami, over 90% of all students are undergraduates. All classes are taught by professors, not teaching assistants. 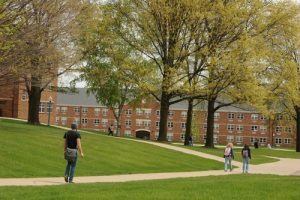 There is a strong commitment to the liberal arts and, akin to Ohio’s Big 5 Liberal Arts colleges, many majors are interdisciplinary by design. While there are also many professional programs, all are undergirded by a strong commitment to the liberal arts. Miami offers over 100 undergraduate major options, with particularly strong programs in Business, Political Science, Nutrition, Physics, and in the Humanities. The three largest majors are all in business and include Finance, Accounting, and Marketing. Kinesiology, Public Relations, Zoology, and Early Childhood Education are also large majors. In addition to strong academics, Miami offers students over 500 student organization with options including a vibrant Greek system (35% of students involved), NCAA Division I athletics, including one of the most exciting Hockey teams in Ohio, over 50 Club Sports, and another 30 intramural sport offerings. Study Abroad is popular at Miami with over 45% of students participating before graduation. Winter break extends over 6 weeks and includes a 3-week “January Term” that many students use to study abroad. All-in-all, it’s doubtful anyone is ever bored in the quaint village of Oxford, Ohio! KSU was established in 1910 as a teacher-training school. 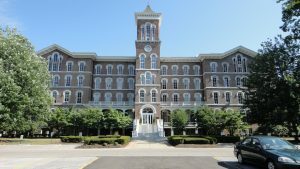 Since that time, it has grown into one of the largest public universities in Ohio with nearly 30,000 students involved in over 300 degree programs offered on its main campus. 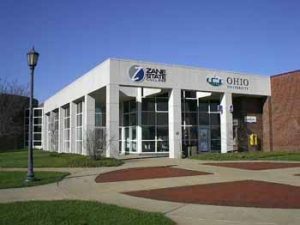 Known nationally for its famous “Fashion School,” KSU offers one of only five Fashion Design majors in Ohio as well as a solid Fashion Merchandising program (see our prior blog on Fashion majors). Rockwell Hall is the home of KSU’s Fashion Museum – check it out. KSU also has one of the largest undergraduate Nursing programs in the country with a number of graduate Nursing program options including Nurse Practitioner. Other signature programs include Aeronautics, Aerospace Engineering, Accounting (and other AACSB accredited business majors), Construction Management, Architecture, Computer Science, and others. In May, 1970, students protesting the bombing of Cambodia by United States military forces clashed with the Ohio National Guard on the KSU campus. When the Guardsmembers shot and killed four students on May 4, the Kent State shootings became the focal point of a nation deeply divided by the Vietnam War. Today visitors to campus can tour a museum dedicated to this piece of our collective history. Students can even choose to major in their nationally recognized Applied Conflict Management program housed in the Center for Applied Conflict Management dedicated to the events of 1970. Beyond academics, KSU offers students over 400 student organizations and a wide variety of activities across the academic year. KSU has a two-year residence requirement for entering freshmen (unless their families live close). Today over 80% of freshmen live on campus. There are over 20 dining options on campus and KSU is know for its great food! 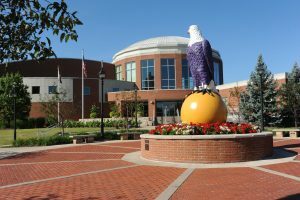 Division I NCAA athletics (the Golden Flashes you know) as well as plenty of Club Sports and Intramural sports are also available. If you haven’t seen KSU lately, it’s worth a visit – you’ll be impressed. 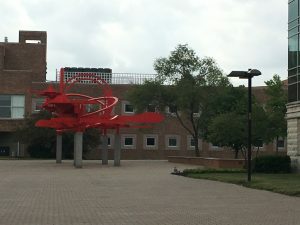 Wright State University, located in Dayton, began in 1964 as a branch campus of Miami University and The Ohio state University. Much of the land WSU sits on was donated by the United States Air Force from excess acreage of Wright-Patterson Air Force Base. 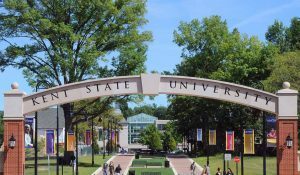 In 1967, following a period of substantial growth, the Ohio Board of Regents transformed the campus into today’s Wright State University. The name was chosen in honor of the Wright brothers, Dayton residents who are credited with the invention of the world’s first successful airplane. Today, WSU enjoys an undergraduate enrollment of 12,000 (3,000 in campus housing and another 5,000 living in adjacent apartment housing) and a graduate enrollment of 4,000. Admission requirements are doable for most and remedial courses are readily available if needed. Students separately apply when they are ready for entry to academic majors which have varying requirements. Strong programs include Business (AACSB accredited business school), Engineering, Nursing, Education, and Theatre. 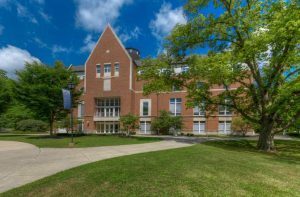 A wide variety of major and minor options, relatively small class sizes, and modern facilities support student learning and success. The WSU campus is ranked 3rd nationally in terms of “physical disability friendly.” This designation is, in part, a result of their more modern facilities and the accessible tunnel system that links academic buildings underground. No need to walk out in the snow storm at WSU! We were impressed with so many things about WSU and also appreciated their low tuition (3rd lowest in Ohio). Check ’em out! 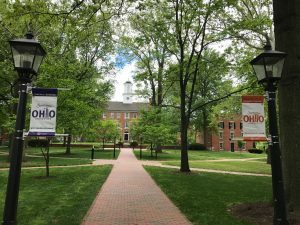 Ohio University is one of America’s oldest universities. It’s charter was proposed in 1787, approved in 1804, and opened for students in 1809. 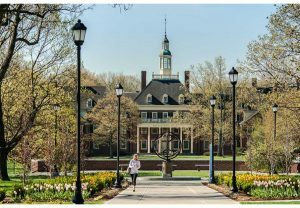 Considered by many, including us, to be one of the most beautiful campuses in America, OU is nestled in the rolling hills of southern Ohio in the quaint town of Athens. OU is known for its strong academic programs in Communication, Engineering, Business, and Health Sciences. 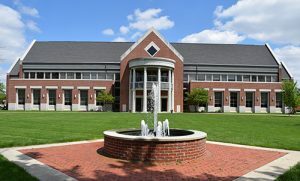 Beyond rigorous academics they also offer students over 450 organization options, an active Greek system, NCAA Division I varsity athletics, a multitude of club sport and intramural teams, a world class recreation center, and a residential campus that is as active on the weekends as during the week. The university’s marching band, The “Ohio University Marching 110,” nicknamed “The Most Exciting Band In The Land,” is nationally recognized and plays at major venues around the country. In 1975, OU established a medical school, known as the Ohio University Heritage College of Osteopathic Medicine. Heritage is the only medical college in the state to award the D.O. degree. In 2011, the college received the largest private donation ever to be given to a medical college in the U.S.
We could go on, but just know that OU has a rich history and lots of exciting things going on – you should check it out!